Home » Getting Your Child Excited About Going To the Eye Doctor! Going to the eye doctor is fun! Kids are nervous about going to the doctor. We’re parents. We get it. It can be a strange and uncomfortable experience going to any kind of doctor. But never fear! Going to see Dr. Nate and Dr. Beth is easy and fun. We are PROs at helping your child relax and enjoy the experience. Here are some things YOU can do to make your child more comfortable before seeing the doctor. Share with your child about your own experience during your yearly eye exam. Explain to your son or daughter that they will actually get to play games and tell jokes while in the office – they are going to have fun! Show them the virtual tour of the offices. You can click and “walk through” both Bright Eyes Family Vision Care and Bright Eyes Kids on our Welcome page. You can learn a little bit about Optometry exam rooms and tools from this Lego Eye Doctor Ideas set. 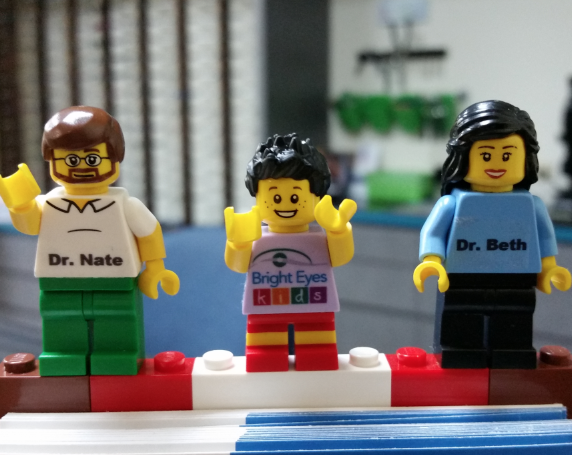 Speaking of Legos, if your child is into it, bring a minifigure to trade with Dr. Nate! Have your child pick one of their least favorite or extra Lego people to donate and they can choose one from a special collection to go home with. If they go to LegoLand, then they will know all about it. Kids love it. Watch Dr. Fischer’s eye exam video together. She does a great job explaining the exam. If they are worried about Dr. Nate or Dr. Beth finding something wrong with their eyes or the way they see, please let them know that we have special ways to help them. Finally, if you have any questions, just give us a call at (813)792-0637 or send a message when you request your appointment.